Led by one of the world’s most powerful millennials – Saudi Crown Prince Mohammed bin Salman, ‘Vision 2030’ is steering KSA into an unprecedented era of social and economic reform. Having adopted entertainment as one of the key pillars in its new development plan, ‘Vision 2030’ initiated the lift on the 35-year-old ban on cinema, which in turn has opened up a previously untapped and lucrative revenue stream for the Kingdom and its entertainment sector. A Kantar TNS study conducted among Saudi residents in 2017 shows fresh opportunities for marketers to make inroads into the Kingdom. As per the research, 67 per cent of respondents said they would head for a round of movie watching and 90 per cent of Saudi residents plan to visit malls with cinemas more often. Thus, cinema advertising is set to become a new growth medium, presenting significant opportunities for advertisers to target young (Saudi Arabia has 32 million consumers with the majority under 25) and affluent (Saudis spend more than $5 billion a year on overseas leisure travel) audiences within KSA. The government of KSA estimates that movie theatres will contribute over 90 billion riyals ($24 billion) to the economy, with about 300 cinemas and 2,000 screens to be built in the country by 2030. April 2018 witnessed the launch of Saudi Arabia’s first cinema operated by AMC Theatres – a single screen cinema with a total seating capacity of 620, followed by the launch of VOX Cinemas at Riyadh Park Mall in May 2018 – featuring an IMAX screen, 2 KIDS screens and 1 VIP screen with a total seating capacity of 330. AMC Theatres will be a major contributor to the total cinema count in Saudi Arabia by 2030, as the cinema operator intends to open 30 to 40 cinemas in 15 cities over the next five years, growing to 50 to 100 theatres by 2030. VOX Cinemas has a SAR 2 billion investment plan in place to expand its footprint to a total of 600 screens in the Kingdom over the next five years. As part of this plan, the leading cinema chain recently announced the opening of the first multiplex in Jeddah at Red Sea Mall by December 2018 – featuring 12 screens which will include three GOLD by Rhodes and an IMAX screen, and a 15-screen multiplex in the first quarter of 2019 at Al Qasr Mall in Riyadh – featuring its signature KIDS and MAX experiences. Al-Rashed Empire Cinema Consortium – who successfully received a license to operate cinemas in the Kingdom in July 2018, will be the third player in the market. The cinema operator has plans to open as many as 30 cinemas in various cities around Saudi Arabia. As the exclusive cinema advertising partner of VOX Cinemas and the only company presently selling cinema advertising in KSA, Motivate Val Morgan has received an overwhelming response since the launch of the cinema at Riyadh Park Mall. 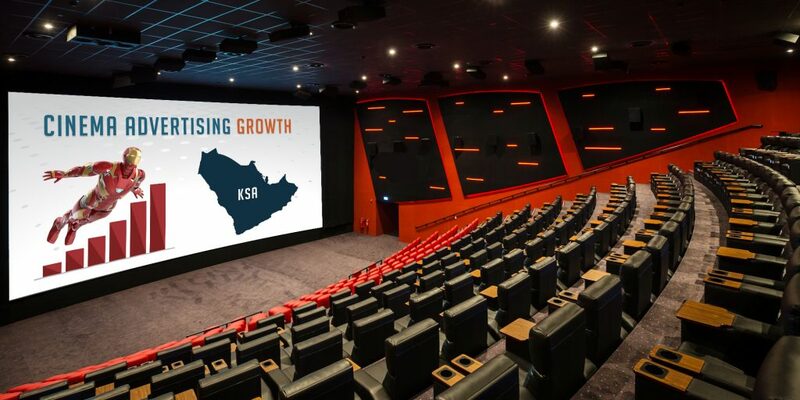 With a growing appetite for international/regional content and world-class cinema experiences, existing cinema operators stepping up plans to open additional screens across the country and more operators expected to enter the fray, KSA presents a hotbed of opportunities for cinema advertisers over the next few years. Meet the first cinema advertiser in Saudi Arabia, browse the list of upcoming blockbusters releasing in Q4 2018 and contact a member of our sales team for more information on cinema advertising opportunities in Saudi Arabia.